Come for a fun night of singing along, dancing, comedy, and outrageous piano playing! It's a great variety show, mixing humor with classics to contemporary and country hits based on audience requests. The event is NOT a concert. The piano players lead a musical PARTY! 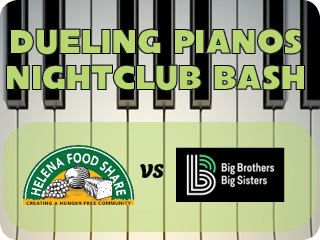 We welcome Big Brothers Big Sisters and Helena Food Share back for another friendly battle. 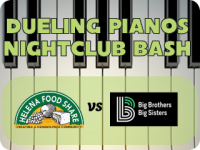 The two organizations will be facing off to see who can sell more tickets and raise the most in song requests to the dueling pianists. Each organization takes home the proceeds that their supporters donate. Doors will open at 7:00 and at 8:00 the nonstop 3 hour party will begin.